"We've been coming to El Palmar for many years now and it never disappoints." Tranquil and beautiful beaches await. El Palmar is a small boutique resort located in Melaque, Mexico on the golden sands of Bahia de Navidad. Intimate and beautiful, El Palmar offers luxury accommodations in a peaceful setting, making it the perfect spot for a relaxed, informal getaway. The Pacific Costalegra Mexico Resort area is a vacation paradise, with coastal villages and sweeping jungles reaching down to the clear blue waters of the Pacific. Located in the heart of this region is El Palmar Beach & Tennis Resort, an intimate, authentic, and family-friendly Mexican vacation destination. El Palmar Beach & Tennis Resort is located in the picturesque town of Melaque, Mexico. Melaque boasts rich local culture, traditional charm, and sincere, friendly people. Bahia de Navidad, the beachfront bordering Melaque, is home to a number of boutique hotels and accommodations. The welcoming staff at El Palmar make every effort to ensure that your stay is as comfortable as possible. This genuine Mexican hospitality sets El Palmar apart from the mainstream Melaque hotels. Many of our guests feel so at home at El Palmar that they return again and again, as they love the open and inviting atmosphere of our unique accommodations. Come explore the tropical beaches and charming town of Melaque from the luxurious suites of El Palmar. As one of the few towns that remains largely untouched by commercial tourism, Melaque is one of the most relaxing vacation destinations in Mexico. The luxury suite and condo accommodations at El Palmar are decorated in traditional Mexican motifs, colors, and tile work. In addition to the beautiful decor, these accommodations feature all the amenities of home including wireless internet access throughout the resort. Travel to the Costa Alegre for a Great Mexican Vacation with El Palmar as your home base! Whether you're looking to spend your vacation in Mexico relaxing on the warm sands of the Bahia de Navidad or participating in the many activities the resort has to offer, El Palmar Beach & Tennis Resort is the perfect place for your family. Melaque family boutique Resorts in Mexico offer activities for the entire family. Some areas of Melaque have rooms for kids to play arcade games while the adults enjoy a game of pool or a little rest from a tiring day of sight seeing. Mexican snack and taco stalls spring up in the evening for dinnertime around the area of Barra de Navidad. If as a vacationer you need a more structured family activity, some tourist restaurants offer traditional dances with the costumes of the Mexican heritage. Mexico Vacation resorts in Melaque also offer structured activities of hiking, biking, and special tours for the tourist to areas of interest. Of all the vacation activities for a family to do in Mexico, whale watching and bird watching tours, offer an opportunity for children to experience things of Mexico they may never see again in their lifetime. The beautiful sights in Melaque and the wildlife around the area, offer something for all the family to remember about their vacation in Mexico. Melaque, Barra de Navidad, and the Costa Alegra have become favorite Mexican resort destinations. When traveling to Mexico for your vacation, remember to pack the right clothes, less is better. Summer months are hot and the winter months are warm during the day and cooler at night. Beach resorts have an informal dress code. Throughout Mexico, casual dress is acceptable. Men generally do not wear ties except for formal events. If you visit other Mexico resort areas, such as Puerto Vallarta, you may need some Mexican style evening wear for the more traditional dining experiences. Weather wise Melaque has the best Mexican temperatures; it would be equal to visiting Hawaii, or Bermuda. Jalisco now has some smoking restrictions so the visiting tourist should show respect for others while in the resorts. Mexicans show emotion and regard vacation friendships and relationships highly. In Mexico it is very important to remember if you make friends with a Mexican family, you are then considered a part of that family and are expected to join them for some family activities. You need to understand import guidelines of Mexico. You can take only two cartons of cigarettes into Mexico, some perfume, a camera, a video camera, and some US goods not exceeding three hundred dollars in value. Always check the customs laws before packing for your vacation in Mexico. Mosquitoes in Mexico generally come out at sunset on the beach, it is best to go inside your hotels or resorts for this period. You may need insect repellant, but all the pharmacies have repellants in a lotion form. Most resorts have control programs for mosquitoes. Your Mexico vacation weather will be wonderful, as this part of Mexico stays warm all year round, the ideal area for your Mexico beach vacations. If you want to avoid delays at the airport, have your passport ready to expedite entry into Mexico and the United States upon your return from your Mexican resort. Tipping on your Mexico vacations is expected for almost everything you do. Taxi drivers usually only receive a tip if they help with the luggage into your hotel or resort. Resort and hotel employees should be tipped according to the level of satisfactory service. If you need to convert US dollars, the Banamex in Melaque is open for six hours a day and can exchange up to three hundred dollars at one time. The ATM machines of Mexico have twenty-four hour service. Make sure your money is not ripped and has no writing on it; the banks will not accept the money. Most Mexico Resorts and hotels have exchange services for their guests. One important thing to remember while on vacation in Mexico, is do not drink the tap water, Mexicans don't. Most resorts and hotels have bottled water for guests to drink. Mexican spirits, wines, beers, and other drinks are found in little shops throughout Melaque along with snacks and any personal items you may need while on vacation in Mexico. Mexican doctors and Dentists interact with patients on a very personal level. Patients are often surprised at the amount of time their Mexican doctor or dentist will spend with them. For those of you visiting our Mexico resort you can be assured of excellent and rapid medical service if needed. Statistically, 10% of tourists anywhere in the world will require some medical care during their vacation. At your Mexico Vacation Resort, El Palmar, you will have 24 hour medical service. Dr. Rosa Vivas de LaPointe has 20 years experience and can look after any of your vacation ailments. This September Dr. Rosa is looking forward to having her brother, Dr. Hector Vivas Alcaraz, an orthodontist dentist, join her here in Melaque. Hector has been a practicing dentist for 30 years. From personal experience I know he practices "painless dentistry." Mexican dental treatments are generally one fourth to one fifth the cost of U.S. dentists. Preplanning your dental needs and treatment can pay for your Mexico Vacation. Travel to a part of "yet to be discovered old Mexico," and the quaint vacation resorts of the Mexican town of Melaque. For your vacation in Mexico on the golden beach of Bahia de Navidad. The perfect Mexico Vacation spot for a relaxed, informal getaway. Enjoy luxury accommodation in a small, secure, intimate boutique hotel, El Palmar. Comfortable, Luxury Suite and Condo Accommodations, just steps from the Mexico Resorts beach. The first resort in Mexico with wireless internet access! We now have internet access for cable or wireless connections in all areas of this Mexico vacations resort. New - 4 NEW Penthouse Condos, just completed. See our rates page for more info and floor plans. For your wedding, honeymoon, or family fun, expect to be spoiled at "El Palmar." Let your friendly hosts at "El Palmar" prepare your Mexico Vacation Packages. 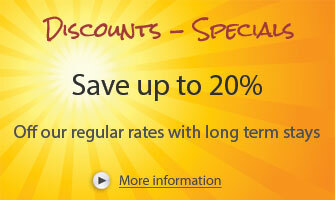 WATCH for our SEASONAL DISCOUNTS and SPECIAL OFFERS. Read about our early booking and extended stay discounts and deals!